Today, there is a lot more to producing precision-machined parts than just the machining. In fact, today’s successful contract manufacturer provides a variety of value-added services in addition to machining. To take a job from a drawing or CAD/CAM file to final, on-time delivery is a demanding task that requires the perfect blend precision-machining expertise, organization and a company-wide commitment to total quality and customer service. At A&B Aerospace we provide a complete precision-machining solution. We offer state-of-the-art CNC machining, advanced CAD/CAM capabilities; an ISO 9001 and AS9100 certified quality system; a cutting-edge ERP system; in-house support services including grinding, honing and deburring; and a staff of professionals and craftsmen with decades of precision machining knowledge and expertise. This powerful combination delivers a world-class level of quality and reliability that keeps us at the leading edge in the precision contract manufacturing industry. Contact us today to learn more about the complete precision machining services available at A&B Aerospace. Since our beginnings in the 1940’s, A&B Aerospace has placed product quality and reliability at the foundation of our business. Our company has grown steadily because we keep our promises and deliver top-quality products consistently year after year. Our commitment to quality and reliability also means a continuing investment in the latest precision-machining technology, and in the people who run it. This technology includes twenty-three modern CNC machine tools, cutting edge CAD/CAM and ERP systems, an ISO 9001and AS9100 certified quality system, and some of the best professionals and craftsmen in the business. Over the years, A&B Aerospace has earned a reputation for exceptional value and uncompromising quality by delivering on our promises. Our customers have come to count on us to deliver what they need, when they need it… and so can you. Contact us today. A&B Aerospace maintains thousands of completed parts in stock and available to ship at a moment’s notice. We maintain this extensive inventory to support our customers’ quick-delivery requirements, as well as our Just-In-Time deliveries and other long-term purchasing agreements. All of our stock items have complete traceability to associated purchase orders, test reports and certifications, and are maintained in pristine condition in our climate-controlled warehouse. Our extensive parts stock is yet another way in which A&B Aerospace supports our customers’ current and future needs with excellent service and reliability. If we’ve built something for you in the past, chances are we’ll have stock parts when you need them. Contact A&B Aerospace to find out more about our stock parts pricing and availability. At A&B Aerospace we understand that even the most advanced manufacturing plant is useless without the people to run it. In today’s competitive business climate, talented and dedicated employees make all the difference when it comes to quality products, reliable delivery and exceptional customer service. A&B Aerospace is proud to have some of the most dedicated professionals and craftsmen in the business. We maintain an ongoing training program designed for continuous improvement at every level of our organization, with incentives and compensation that attracts and retains the most talented individuals you will find anywhere. We know you have a lot of options when it comes to choosing a supplier, and our goal is to make A&B Aerospace your first choice. This means our team goes the extra mile for our customers, building long-term relationships based upon reliability and performance. Let the A&B Aerospace team show you what we can do for you! A&B Screw began manufacturing washers, screws and small pins in the 1940’s, when computer-controlled machining was still the stuff of science fiction. Much has changed in the manufacturing world in the last seventy years – including our name – but our long-standing commitment to exceptional quality and outstanding customer service remains at the cornerstone of our success. Exceptional quality and outstanding customer service. Today, A&B Aerospace is at the leading edge of the precision contract manufacturing industry with twenty-three modern CNC machine tools, and a host of support equipment including centerless grinding and precision honing. We maintain our own, in-house precision deburring department which gives us additional control over the manufacturing process. We can machine materials from aluminum to titanium to plastic while maintaining tolerances of .0001”, and we offer state-of-the-art CAD/CAM capabilities that integrate seamlessly with your digital data sets. We are certified to ISO 9001:2015 and AS9100D. Our entire operation at A&B Aerospace is organized for one purpose: to deliver your parts and assemblies to print and on time, every time, while providing the best customer service in the business. 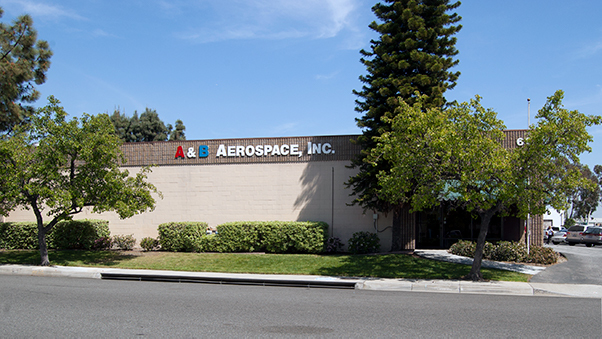 With more than seven decades of manufacturing knowledge and experience behind us, A&B Aerospace offers you the latest in manufacturing technology combined with a team of professionals and craftsmen committed to delivering total quality, unbeatable customer service, and outstanding value. We invite you to learn more about what A&B Aerospace can do for you. Please call us at (626) 334.2976 or email us and let us show you what seventy years of precision machining expertise can do for you. More than seven decades of manufacturing knowledge and experience.